I want to be able to have kids to Scratch programming without an Internet connection on an open source desktop distro, in spite of Adobe AIR no longer being actively supported on Linux. Now, we can run the AIR installer. 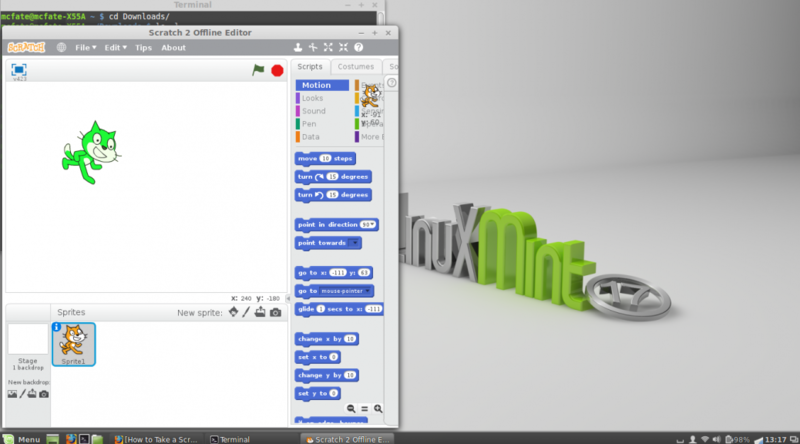 Next, browse to http://scratch.mit.edu/scratch2download and grab the Linux version of Scratch.air. If your browser doesn’t offer to open it with the Adobe Air Installer application when it’s been downloaded, find the file, right-click on it, choose “Open with…”, browse to /usr/bin and select the Air Installer. You should have a working version of the Scratch 2 Offline editor when the install has completed. Previous PostMr. Benedict Tests Out a HypothesisNext PostIt’s That Time of Year Again! I’m trying to set up a Scratch environment on my Linux Mint machine so I can learn it myself, then get my various grandchildren going. I was very interested to see your post on http://www.acme-dot.com/installing-the-scratch-2-0-editor-on-linux-mint-17/ but unfortunatley it does not work for me. Well, that’s a pretty old version of Mint. and see if you can locate it. Do the same for libgnome-keyring.so.0.2.0. Then set up the symlinks as directed, but pointing at the actual locations of these files. OH, WAIT. It’s looking for a GTK library…? I think you’re going to need to upgrade to something newer than Mint 13 for this to work. Thanks, I guess I will have to upgrade and try again. Hey there. Have you figured out how to make simple a site smartphone pleasant? I’m trying to find a theme or wordpress plugin that could possibly resolve this issue. If you have any suggestions, please share. Easy inquiry that’s thoroughly off of theme. My web site seems peculiar when surfing. Any WordPress theme that describes itself as being “responsive” should handle a variety of screen sizes correctly. A search on WordPress.org for “responsive” turns up close to 800 possibilities. Just wanted to say thanks for this post. Couldn’t get Scratch 2 to load but setting up the symlinks using your instructions fixed it. Thanks for sharing! Glad that was helpful to you. Hi – I’m trying to get this going on a 32-bit system (it’s an old donated laptop I’m trying to re-purpose for teaching kids to code). I’ve copied your terminal commands, substituting i386-linux-gnu for x86_64-linux-gnu. But Terminal says ‘Permission denied’! When I list the directory I can see libgnome-keyring.so-0 but when I look at it in the GUI it’s listed as a ‘Link to Unknown’. Should I try to re-install GNOME KEYRING? Fixed it, I was just missing a bit of the command line. Too many hours looking at tiny screws today, I think! BUT still worth mentioning the i386-linux-gnu directory for 32-bit installations. Everything else works exactly as you describe, so THANK YOU! This is a huge help! Thanks for the tip. I hate that the authors of Scratch have made it so difficult and – closed – to install Scratch. It really ruins the point of the application. I hope someone forks Scratch 1.4 and keeps it open and easy! I followed the instructions exactly without problem and it seemed to install with no problems and it appears in the applications folder in the accesories folder. During the installation process I checked the box for the program to start at the completion of the installation. I did this installation in linux mint17.2 kde. My problem: When it starts I get a window that is mostly blank. There’s a bar at the top with the usual options on the right: shrink, maximize/minimize and close. On the left there’s an arrow for a drop down menu with things like mimimize, maximize, move, resize, always on top (and other display options) and close. But there’s nothing present for actually using the program. I closed the program an reopened it from the applications menu and it’s the same. I even tried rebooting and then opening it and it still gave the same result. I’m not sure I could tell you without being able to poke at your PC. Maybe Java’s not properly installed? How can I make sure java is properly installed? If you don’t know how to use apt, you need to learn how to use apt. I’ve just followed your instructions to install onto a 32bit Linux Mint 17.1 laptop. Air and Scratch 2 seem to install just fine, I created the necessary symlinks for libgnome-keyring form /usr/lib/i386-linux-gnu to /usr/lib. However when running scratch either from Desktop shortcup or from command line, i just get a white blank screen. I then tried creating symlinks for *gtk* found in /usr/lib/i386-linux-gnu, still no joy. So I don’t think it’s Java related, really would appreciate help here as I want to use this laptop for my son to go to CoderDojo classes, I don’t own a windows laptop so this is my only option. Running from CLI show no errors on screen, not sure how I might trace this further, all help appreaciated. Hm, I’m not really sure what to suggest here. Seems to work fine on my Mint system, and I can’t discern what might be different from the information you’ve provided, sorry. If I have any brainstorms, I’ll let you know. I am really grateful to the holder of this website who has shared this great post at here. Thanks, I’m happy you found it useful! You’re quite welcome, glad it was useful. No idea, I’ve never seen anything like that. Do you have gnome-keychain installed?